Les Peneyrals Campsite is a fantastic quality 5 star campsite that lies deep in the heart of the Dordogne countryside. This wonderful family friendly campsite is a firm favourite with families of all ages looking to explore all that this majestic region has to offer whilst still having plenty of activities to do on site. The campsite lies in a beautiful setting and the owners have made the most of the fantastic landscape with an abundance of trees, bushes and pleasantly coloured flowers located all over the site to give a real feeling of luxury and relaxation. Considered to be one of the most luxurious and best campsites in the area, Les Peneyrals Campsite boasts a fantastic range of on-site activities and one of its best and most used features is its on-site lake. You’ll also find that the campsite puts on some really great evening entertainment to ensure your evenings are as much fun as your days. The other great thing about Les Peneyrals Campsite is the swimming pool complex that lies at its heart. Here you’ll find a staggering 5 swimming pools, a variety of slides and a superb water jet play park. Children and adults alike will find this the perfect place to have fun and for those looking to chill out, there’s also a large sun terrace where you can sit back, relax, read a book or just watch everyone else splashing around. 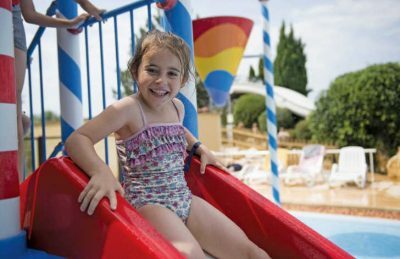 Les Peneyrals Campsite offers a comprehensive selection of activities and facilities on site and also nearby to ensure you have a fantastic family holiday. On-site activities at Les Peneyrals Campsite include tennis, table tennis, football, basketball, badminton, volleyball, boules, archery, mini golf, fishing, trampoline, playground and cycle hire. Facilities available at Les Peneyrals Campsite include WIFI, restaurant, snack bar, pizzeria, takeaway, bar, groceries, games room, animation team, washers and dryers. Accommodation at Les Peneyrals Campsite includes a range of 2 and 3 bedroom mobile homes that are available from Eurocamp.